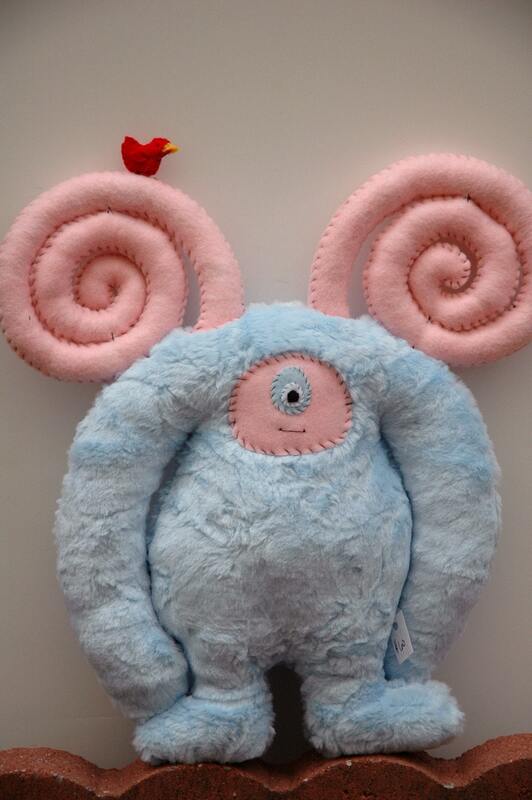 Diane Koss from Cutesy but not Cutesy designs and makes hand-stitched, one-of-a-kind plush toys. I originally started making small felt ornaments for the holidays to sell at the cafe where I was working. I wanted to raise money to donate to charity and the response was amazing. People kept asking me if I made larger items, took custom requests, etc and so I decided to open an Etsy shop and start sewing! The ornaments were much more traditional that what I am currently making but I really wanted to get creative with it and to stretch my imagination and my skill. I started getting more and more interested in the designer toy movement and started my own collection of vinyl and plush designer toys as inspiration. I like how my work can cross the boundaries of art and craft and for young and old. My favorite thing to do in the whole wide world is to see the smile on the child's face when they either are about to or already have picked out their favorite monster at a craft show. I can see in their eyes that they will love it forever and remember it always. Sometimes I can see myself in the little girls, how excited they are, how much they want to touch each one, and how they're formulating some sort of imaginative story in their little minds. If I could do this while eating a cupcake (or cupcakes) and surrounded by my best friends...that'd be the ultimate favorite thing in the whole world. I would like any of the larger monsters with big, crazy horns. The more extravagant the horns the better. I'd build it a shelf and surround it with my other favorite designer toys. I had high hopes of being a fireman and a gardener. I'm not sure when I gave up on being a fireman but I have developed a bit of a green thumb. I love to grow my own vegetables in the summer and cook special dinners for myself in between sewing my fellas. I have to say that I adore my sister's shop... www.rkoss.etsy.com ...her work is sometimes just too cute. I also really enjoy... www.curster.etsy.com ...I love the idea of freestanding vinyl plush. I have too many favorites to name them all, most of them can be found under my favorites on Etsy. Etsy is just filled with so many wonderful and innovative designers it's really hard to narrow it down! If only I knew what the future held. I have big plans of developing my own website and expanding my shop to include some Cutesy screen-printed goodies. I'm also hoping to write a children's book to go along with my plush designs. I'd like to have my work in as many galleries, shops, and boutiques as possible and I am going to continue traveling up and down the east coast selling at various craft shows. I'd eventually like to get my MFA and teach college students (photography not monster making) and ultimately I'd like to open up my own brick and mortar shop. I guess I have a lot of plans...but who knows what the future really holds! Visit Diane at her shop Cutesy but not Cutesy or on her blog at dkoss2.blogspot.com. And don't forget to help support local, handmade toy designers and entrepreneurs by signing this petition to keep them in business!